Another gem from the vast jewel stores of the Swedish royal family, the Connaught Tiara has 5 distinctive upright loops of forget-me-not wreaths with a diamond pendant suspended in each. Between the loops, upside down bows support single diamond uprights. Made by E. Wolff & Co., it was a wedding gift to Princess Margaret of Connaught from her parents, the Duke and Duchess of Connaught, when she married Prince Gustaf Adolf of Sweden (the future King Gustaf VI Adolf) in 1905. Margaret died in 1920, and her son (also called Gustaf Adolf) gave it to his bride Princess Sibylla of Saxe-Coburg and Gotha as a wedding present in 1932. It was a favorite of hers, and is still often called Princess Sibylla's Tiara. By the time Queen Silvia married into the Swedish royal family, Princess Sibylla had passed away and her son Carl Gustaf was king. Silvia chose this piece for her first public tiara appearance at her pre-wedding gala (above, far left) and she continues to wear it to this day. Other royal family members have worn it since Sibylla's passing, though, including Princess Christina on her wedding day and Princess Madeleine on Crown Princess Victoria's wedding day. Crown Princess Victoria herself first wore the full tiara in 2015, to Prince Carl Philip's wedding. It's a flexible tiara: you can take it off the frame and wear the whole thing as a hefty necklace (this isn't done too often) or you can use the diamond pendants on a chain as a necklace of their own, or as earrings. The pendants as a necklace seems to be a favorite accessory for Princess Madeleine. This is a tricky one, I think. 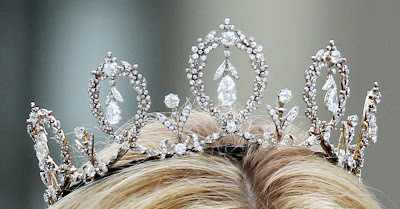 Like so many tiaras, it needs the proper nest of tiara hair to make it shine and I'd say it also needs special attention to the overall styling of the look. Otherwise, it's in danger of looking a barbed wire necklace on your head. Who do you think wears this one best?